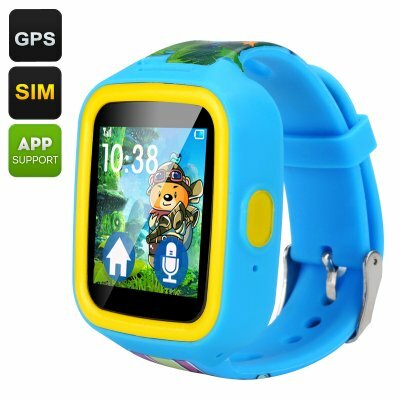 Successfully Added GPS Tracker Kids Watch Phone - GSM, SOS Button, Two-Way Communication, Pedometer, 1.44 Inch TFT Touch Screen (Blue) to your Shopping Cart. The GPS tracker watch phone will let you know the exact location of your child at any time throughout the day. You can also give them a call, track their route and preset a number to use in case of emergencies. A simple compact blue smart watch boasts lots of hidden functionality, including accurate GPS tracking, Pedometer and can double as a phone. You will always be able to give your child a call without the need for him or her to carry a bulky smartphone. You will also know where your child is at all times and be able to track their route – a great feature for your peace of mind and your child’s safety. With a large battery life: 48 hours in use and one week on standby, the smart watch phone won’t run of juice at the worst moment. A simple yet sturdy plastic wristband in bright blue will keep the gadget securely in place on your child's wrist. A simple press of the SOS button will immediately initiate a call to one of the preset numbers and get your child help should she or he ever need it. The watch is easily synced with a smartphone - both iOS and Android platforms are available. This gives you extra functionality and easy communication. The 1.44 inch HD touch screen is fun for your kid to play with and easy to operate. So, your child should get a hang of the gadget in no time! A built-in Pedometer is also a great way to make sure your child gets enough exercise throughout the day. The GPS Tracker Kids Watch Phone comes with a 12 months warranty. Brought to you by the leader in electronic devices as well as wholesale kids GPS tracker watches.. Very happy with the quality and the performance of the watch. Strong GPS signal.